I don't make pizza as often as when I first learned how to make it, so every now and then I get the urge to get my hands into a nice batch of pizza dough. That urge hit last weekend. It was good timing, because I had some mozarella cheese in the refrigerator, and some asparagus from my first trip of the year to the Green City Market since it moved back outdoors. Which reminded me of all that marinara sauce and pesto that I had made last summer with those sensational San Marzano tomatoes and beautiful bunches of basil. I still had a jar of each in the freezer, so I needed to use them up so I could get started on more this summer. I will put the marinara sauce to use with fresh pasta, which I have also not made in a while. I have recently discovered that, while I like pesto, I do not really like it with pasta. It is somehow both too oily and too dry to me at the same time. I only recently discovered this because every time I thought about the pesto in the freezer and how I would use it, I would think of pasta and reject it out of hand. At some point it clicked that it was the combination of pasta and pesto that I was rejecting, so I started to think of different ways to use the pesto. 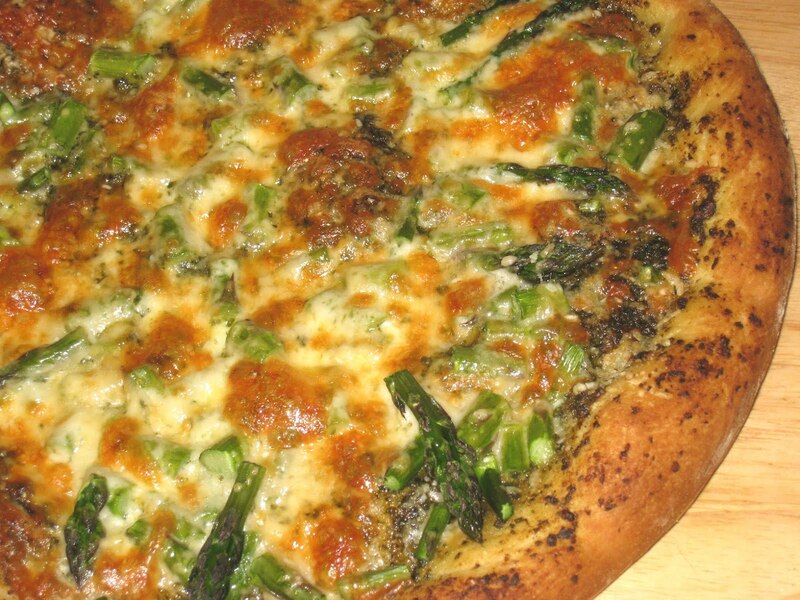 Several years ago, on one of my visits home, my sister made a vegetable pizza with pesto as the base. It was good, and I went home with every intention of duplicating the recipe. But I had not yet worked with yeast and was reluctant to use the mix that she had used, so I tabled the recipe and the idea, and then forgot about it. I remembered it this weekend as I was thinking about pizza and pesto. I took the last jar of pesto out of the freezer and kneaded up a batch of pizza dough. The result was delicious. 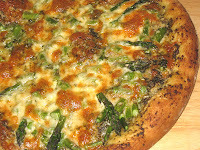 The pesto melted into the dough and spread is fresh basil goodness through the cheese, asparagus and olives. The oil from the spread gave such a lovely crispness to the crust that I am thinking I will spread a little olive oil on all of my pizza dough in the future. Since my dough makes two pizzas, I was able to make each one a little different. For this first pizza, I did not remember that I had green olives, so it is just the pesto, mozarella, asparagus, and parmagiana reggiano. This one perfectly illustrated the "less is more" theory of pizza. Those four ingredients came together to form a deep, rich, intense flavor where each one was discernible on my tongue before they all came together to form a fifth, transcendent flavor that was the overall pizza. A big success. The green olives were the only ingredient I added to the second pizza, and I can't say for sure which one is better. They were different, but equally delicious. The olives added that sour saltiness that satisfies some deep, ancient craving that I often don't even know exists until I taste it. That being said, however, without the olives the flavors of the other ingredients are more pronounced. Luckily, I don't really have to choose. I can make one with and one without and enjoy the best of both worlds. Preheat oven to 475 deg. F.
Once pizza dough has risen and is ready to go, roll or pat into a 12-inch round and place on a pizza peel or pan lightly dusted with cornmeal or flour. Lightly brush some of the pesto over the entire crust and bake it on the bottom rack of the oven for 5 minutes. Remove the par-baked crust from the oven and layer a more liberal amount of pesto over the crust, being careful not to make it too thick. 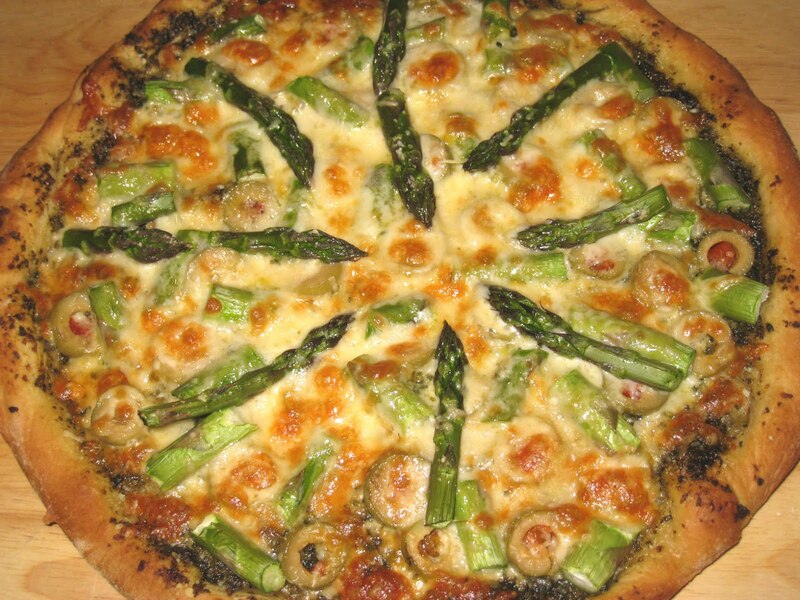 There should be enough to cover the crust completely in a single layer Spread the asparagus pieces over the pesto, then sprinkle half of the mozzarella over the asparagus. Spread the olives over the cheese, then lay the asparagus tips in a circle around the base of the pizza. Sprinkle half of the parmigiana reggiano over the toppings. Put the pizza back onto the bottom rack of the oven and bake for another 10-15 minutes, until the cheese is golden and the crust is well browned. Remove from the oven and slice and serve immediately. The second pizza can be made at the same time as the first, or the dough can be kept in a sealed plastic bag in the refrigerator for up to 3 days, or in the freezer for a few months. Let come to room temperature, then proceed with the above instructions. It was delicious, Raquel. I don't hate pesto with pasta, but I have only recently realized that I don't love it, either, and given a choice I will use it some other way. Thanks for your comment!